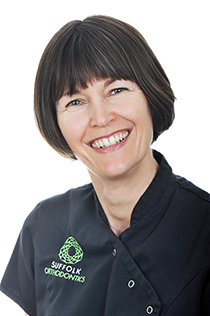 Lynn gained her National Certificate in Dental Surgery Assistant (NEBDSA) in 1984 and worked as a qualified Dental Nurse in various general practices within the Ipswich area. In this time she built up her knowledge of dental treatment and procedures and gained a wealth of experience dealing with patients, general public and different dentists! She went on to achieve a qualification in Dental Radiography for Dental Nurses and then joined Suffolk Orthodontics in 2000. Here, Lynn became more specialised as she was now only working in orthodontics and achieved her Orthodontic Nursing certificate in 2009. Also in 2009 Lynn took on the arduous task of Practice Manager. This means she now line manages 7 Dental Nurses and 1 receptionist and also has to keep in line 5 clinicians of various grades and ensure that the boss is always happy! Furthermore, Lynn has to oversee very busy clinics and keep abreast of all the general business management issues of the practice. In her spare time Lynn, enjoys long walks with her husband, and the quiet life now that her daughter has flown the nest. Qual – Cert in Dental Surgery Assisting NEBDSA 1984.